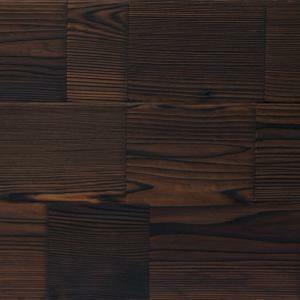 CUBISM features both charred and non-charred western red cedar in a range of colors including neutral and bold color tones. TELFORD, PA, UNITED STATES, July 17, 2018 /EINPresswire.com/ — CUBISM by reSAWN features 11 new designs on Western Red Cedar (WRC) that are engineered to add graphic interest and geometric pattern that both contrasts and compliments the natural grain of the cedar. Using only Clear A&Better Mixed Grain Western Red Cedar, “blocks” ranging in lengths from 3” to 11” are finger jointed together to create consistent plank dimensions of 11/16” thick X 7-1/4” wide X ALL 16’ Long. Finger jointing is a woodworking joint made by cutting a set of complementary rectangular cuts in two pieces of wood, which are then glued, with a high quality PUR adhesive. To visualize a finger joint simply interlock the fingers of your hands at a ninety degree angle; hence the name “finger joint”. The “blocks” are recovered from trim backs (typically a very high quality waste product) from various parts of the production process of milling WRC into traditional products. The planks maintain the superior durability characteristics of Western Red Cedar and have the additional benefits of staying straight and flat, allowing for little or no warp in the material prior to installation. reSAWN TIMBER co. brings our award-winning CHARRED technology to the engineered Western Red Cedar. Using our contemporary take on the ancient Japanese fire-burning technique of shou sugi ban, reSAWN’s charring process adds both performance and aesthetic characteristics to CHOCHOL, 4TH DIMENSION & BAUHAUS. The CHARRED designs are carefully charred, misted with water, cooled, brushed and then stained/sealed. The top coat sealer is applied prior to shipping (for exterior applications, we recommend sealing the back side as well as the face). The burning process accentuates the wood grain and joinery and creates varying colors when viewed from different angles and in different light. 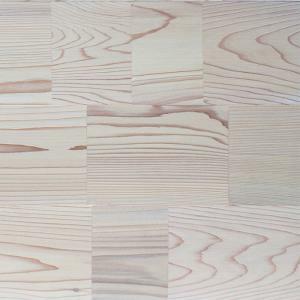 Our non-charred designs are designed to highlight the graphic interest of the wood grain and joinery of finger jointed Western Red Cedar through a variety of finishes. reSAWN offers SALLE 41, DIAMANT, GRIS, MARE, NO. 609, VILLA SAVOYE, PABLO, and PRINCET as a non-CHARRED way to capture a variety of different aesthetics from subtle white and gray tones to eye-catching bright colors. 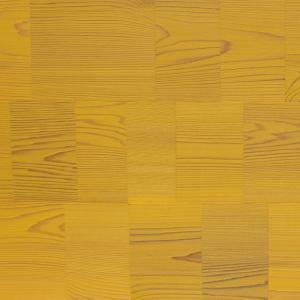 All designs are standardly offered in Clear grade and can be treated to Class A Fire Rating for Interior Application. These products are appropriate for interior wall cladding — please call reSAWN to discuss using for exterior applications.